How do you explain the fact that your home has been overrun by pests? And not just any pests – rodents – mice to be specific! If this has never happened to you before, you may be feeling quite outraged and invaded. But try not to take it too personally – a mice infestation can happen to anybody and is in fact quite a common problem. So keep calm and think through your options carefully. The following pointers will give you some background information which will help you to understand how the infestation happened in the first place, the possible extent of the infestation, what you can do about it, and how to prevent future infestations. How Does a Mouse Infestation Happen? Mice will try to enter human dwellings in search of warmth, safety and a food supply, especially when the weather begins to get colder during fall or autumn. With their small and flexible body shape, mice are able to squeeze themselves through extremely small spaces, even as narrow as a pencil. Any cracks or holes in your walls or floor boards are seen as an open invitation to a mouse. They can also slip through sewer lines or window and ceiling spaces. Mice are nimble jumpers and climbers. They can balance on the thinnest of wires like professional trapeze artists. Favorite places for mice to live and breed would include your garage and attic – anywhere that is dark, warm and undisturbed. What can you expect to see from an infestation? What should you expect? These are two questions you need to know the answers to stay safe and to get an stand a chance against an infestation. As soon as you begin to see signs like droppings around your home, or hear scratching, squeaking noises you will know that you have some rodent company. Other signs may include actual sightings of mice scurrying to and fro, or evidence of gnawed plastics, cereal boxes or furniture. You may also pick up a musky kind of odor, especially in nesting areas. Even if you start off with one or two creatures in your home, it is likely that in a very short time you could have a full blown mice infestation. Youngsters are able to reproduce at two months of age and babies are born barely three weeks after mating. A female mouse can have up to ten litters in a year with six or more per litter. So if left unchecked, within a matter of months it is possible to have hundreds of mice in one location. 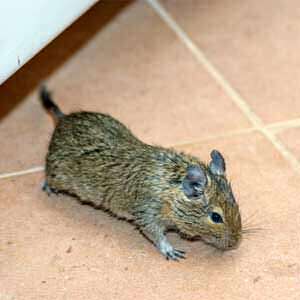 Mice can pose a considerable health risk as they are known to carry diseases, bacteria, viruses and parasites which can affect both humans and animals. They leave their droppings as well as saliva and urine patches which can all contaminate your living areas. This is especially true if you have mice running through your kitchen at night and touching things like coffee mugs, chopping boards and counter tops. They can also chew through electrical wiring, creating a fire risk in your home. Okay, so we know they’re a problem and they need to go. What do you do? How do you get rid of them? You have two options; read on to find out how. It is important to address a mouse infestation problem as soon as possible after you become aware of it. As mentioned above, population explosion is a serious factor when it comes to mice. There are many options for eradicating rodents from your home and initially you may well want to try out the DIY route. Various kinds of traps are widely available which you can either buy or make yourself. Traps may be designed to kill the mouse or result in a live capture. Then there are the poisons and repellents (like FreshCab), or you may prefer to do it the natural way, using strong smelling drops and sprays. If you do not succeed in quickly nipping it in the bud, it is highly recommended to get professional help to deal with your mice problem. Exterminators have the training and experience to know exactly how best to rid your home of mice. They can identify the most likely places where your resident mice population is breeding, and they will have a realistic idea as to how long it will take to flush them out. Professional mouse control experts know how to use traps and poisons safely, and they should also relieve you of the unpleasant task of cleaning up afterwards. Seal up the cracks and holes: Make sure that all your doors and windows close securely, and seal up any cracks or holes around your walls and floorboards with metal or cement. Food storage: Keep all your groceries in glass or metal containers with well fitting lids. Don’t leave any food scraps lying around and remember to sweep the kitchen floor every evening. Cleaning: After you have had a mouse infestation you would need to do a thorough clean and disinfect your home to get rid of any lingering germs or bacteria. Be especially careful to keep kitchen surfaces clean and disinfected. Clear clutter and dust: If your garage or attic has piles of clutter, clear these away as mice are less likely to feel comfortable in a neat and tidy area. Watch out for piles of dust in corners or under heavy furniture, as mice enjoy nesting in these dark areas, particularly where there is debris or forgotten clutter. Sweep, mop and vacuum your floors regularly. Put away the pets’ food bowl: You may be in the habit of leaving out your dogs or cats bowl all day with bits of uneaten food. This may prove too tempting for mice in search of a new home, so rather clean out the bowl after your pet has eaten. Having a mice infestation is not a train smash, but it does require some decisive action to be taken as speedily as possible. As soon as you have the slightest inkling or whiff of a mouse in your house, don’t ignore it and hope that it will go away, because chances are the mice will like your home just as much as you do. So stand your ground and enjoy your pest-free home the way it’s meant to be. Get a chance to win free pest control products. Subscribers to my newsletter are automatically entered to win free pest control product giveaways.You'll also get access to my newsletter--receiving helpful tips, tricks, updates, and money saving promotional offers. SIGN UP NOW!